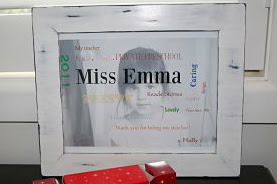 This was a really simple but thoughtful little project I did for my daughter's preschool teacher this year. In Pages I created subway art words for her teacher's name and then asked my daughter all the things she liked about her teacher. She came up with caring, pretty, funny, etc. I added all these words in different fonts, colours, directions and sizes. Then I placed a black and white image of my daughter in the background. I printed this to A4 size on photo paper and then framed it in a white frame. I distressed the frame and then added a coat of clear wax to protect it. I'm also enclosing a bon bon of chocolates and a very cute little homemade card. I'll show you how I made the card in separate post.